A cracked tooth can be a serious pain in your smile. In most cases, a cracked tooth can be saved, but you will need to act quickly to prevent further damage. Teeth can become cracked as a result of bruxism, damaged fillings or excess stress on the tooth. Symptoms can include pain when chewing or in response to temperature changes. This pain is caused by the nerve of the tooth becoming irritated. Over time, the tooth may begin to hurt constantly, or you may develop an infection inside the tooth and in nearby tissues. 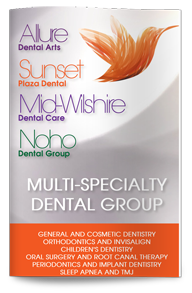 We can schedule an emergency visit with our dentist in West Hollywood and determine the best steps to take to save the tooth or prevent other dental problems. Use warm water to rinse your mouth and clear away any irritating debris. Cold packs can reduce swelling and pain. If there is any bleeding, cover the tooth with gauze or a tea bag and hold it in place by biting down gently on it. Over-the-counter pain medications can help combat the pain until you can get to the dentist. At your appointment, we will determine the extent of the damage and the best way to treat it. Endodontic therapy may be needed to remove the nerve of the tooth, and this will be followed with a dental crown, which will hold the cracked tooth together and restore its function. Rarely, a cracked tooth will need to be extracted if it cannot be treated and repaired. To protect your teeth, avoid chewing on hard objects, such as pens, pencils, ice and popcorn kernels. If you grind your teeth in your sleep, wear a night guard to protect them. You will also need to wear a mouthguard if you play contact sports.